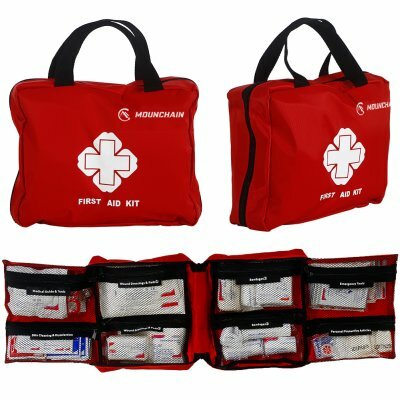 Successfully Added Mounchain First Aid Red First Aid Kit(Zipper Pocket) to your Shopping Cart. HIGH-QUALITY RIPSTOP FABRIC: The First Aid Kit is practical, ripstop fabric, high quality, eco-friendly and non-toxic, high-quality material could be used for a long time. 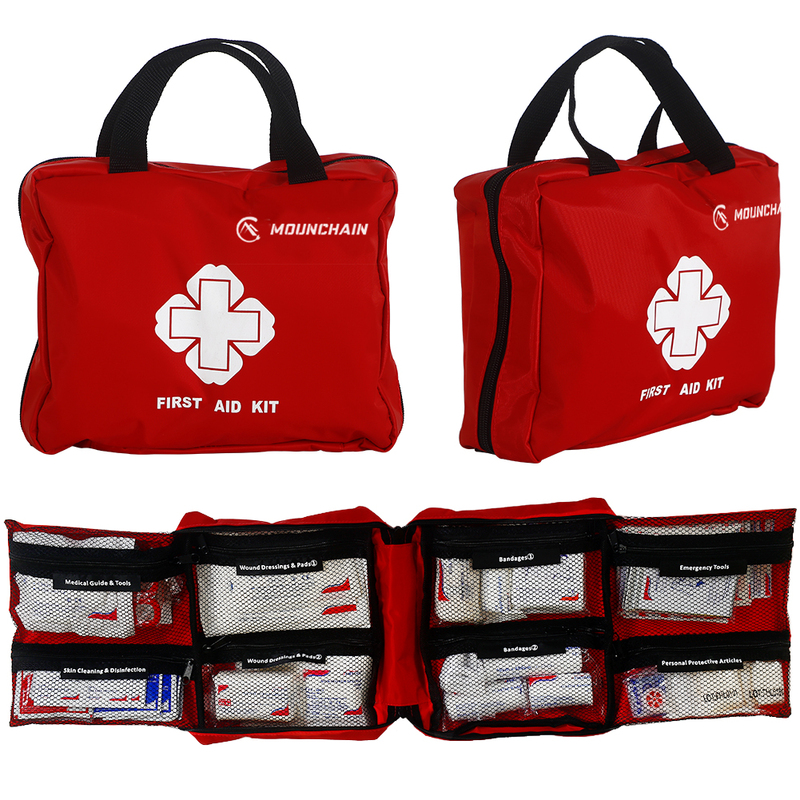 SUPER LARGE STORAGE SPACE: The First Aid Kit itself has enough capacity to load 8 items totally 148 pieces accessories, it could meet your emergency needs well and help you to keep those emergency items organized and shipshape. LIGHTWEIGHT AND PORTABLE EMERGENCY KIT: The first aid kit is small, lightweight, and portable. Easy and convenient for you to carry anywhere. Great for your emergent use. WIDE USAGE: The emergency kit has wide applications, suitable for indoor/outdoor occasions and activities. Excellent for road trips, fishing, boating, hiking, backpacking, camping, mountain biking, hunting, the office, school and home. NET MESH MULTI-FUNCTION POCKET: The Storage room is enough large, matched with English label on each pocket, easily find what you want at a glance. Also easy to put the premium sterile medical supplies in or out. It's very convenient, practical and durable to use. The emergency is easy to package, small and practical, super light and portable. The accessories are complete and in large quantities, has a better quality than marketing. It could meet your emergency needs well and help you to keep those emergency items organized and shipshape. High-quality ripstop fabric, Eco-friendly and non-toxic, It's good for you to use, and brings benefit for your life. Carry the emergency kit easily when you make the indoor or outdoor activities in case you meet trouble with your body and also could help others more quickly. Suitable for occasions: Suitable for indoor/outdoor occasions and activities. Excellent for road trips, fishing, boating, hiking, backpacking, camping, mountain biking, hunting, the office, school and home.